A few weeks ago I visited The Winnie-the-Pooh: Exploring a Classic exhibition which currently taking place at the Victoria and Albert Museum, London until Sunday, 8 April 2018. Entry is £8.00 for an adult, free for children 0-11 with a paying adult. Other Concessions do apply. The exhibition is ticketed and tickets can be booked in advance online and is recommended. We booked our tickets a few weeks before visiting. The exhibition is beautifully and creatively put together to showcase the love and story behind the classic Winnie the Pooh. The whole space is used perfectly and really showcases the fun of Winnie the Pooh. As you enter, the ceiling is filled with floating blue balloons and a giant ‘Hallo’ greets you. The exhibition starts by showcasing merchandise past and present of the lovable bear and his friends from the Hundred Acre Wood. It was great to see how the merchandise has changed over the years including pieces from Disney Store UK and Cath Kidston. The exhibition is perfect for the entire family. 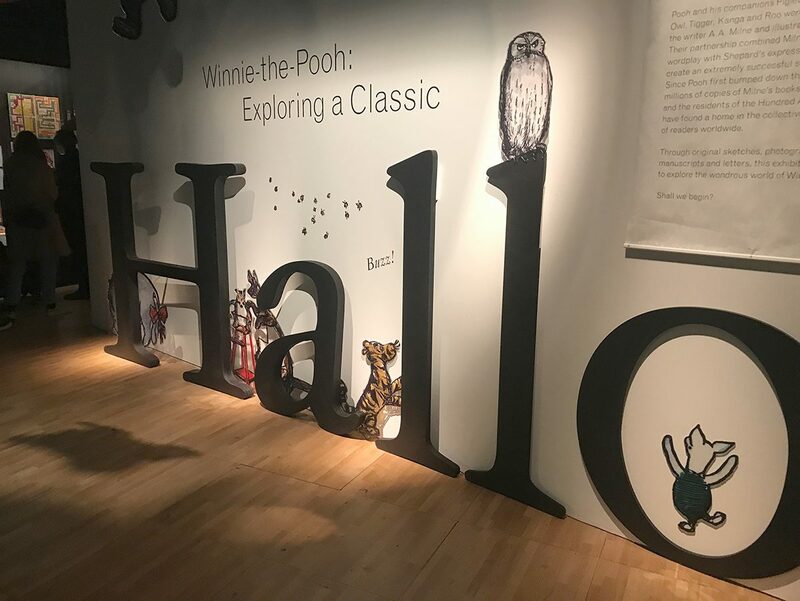 The exhibition largely focuses on the artwork and writing of the original Winnie the Pooh story, so if you are expecting lots of the Disney version of Pooh then you may be disappointed. Personally, I loved all the artwork on display. It was amazing seeing the genuine art from the books and read about the pieces. The exhibition also had first editions of the books on display which was amazing to see! There are plenty of things to do if you are visiting with children. They can have a sit on the Thoughtful Spot, pay a visit to Eeyores ‘house’ and there is even a slide for them to enjoy! The exhibition isn’t the largest I have ever been to, but I think for £8.00 there is plenty to do and see. It is suitable and fun for the whole family and I would definitely recommend paying a visit if you are in the area. As a massive Winnie the Pooh fan, this exhibition was perfect and I’m so happy that I got the chance to give it a visit. I managed to only buy one item whilst I was there, even though I did see so many things I could have bought. I decided to purchase the book Winnie-the-Pooh: Exploring a Classic. It is an absolutely beautiful book with such outstanding quality and design. It is a hardback and quite a substantial size. The book details the history of Winnie-the-Pooh in great depth, the development and design which created the bear we all love today. 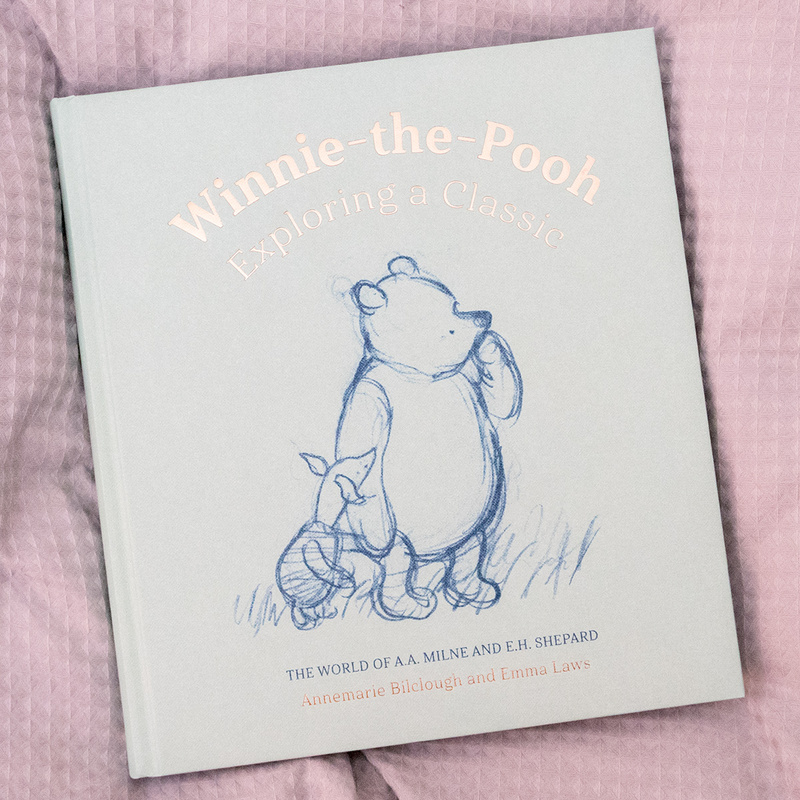 Winnie-the-Pooh Exploring a Classic is available online from Amazon UK here, currently £20.40. Whilst I personally only bought the book from the exhibition, my Mam very Kindly surprised me by getting me the Classic Eeyore Soft Toy. I love him so much! The Classic toys have such a lovely, traditional style and I love all the detail. Eeyore, Pooh, Piglet and Tigger in the Classic style are available from a variety of online retailers including John Lewis. I made a note of a few pieces of merchandise from the gift shop to purchase at a later date.. Most of these I had never seen before so I thought they might be worth sharing incase you are a Winnie the Pooh fan like me, which I assume you are if you are reading this post! I hope you enjoyed reading this post and if you get the chance to visit the exhibition then enjoy! Also the time this post is published it is Winnie the Pooh Day, so Happy National Winnie the Pooh Day! This looks like such a lovely exhibition! If I get to London between now and April I’ll try and get to look. That Eeyore is so adorable!